Before I get too caught up in posting Spring inspired recipes, I wanted to pause and do another post about recipes that I've tried from other blogs lately. As I've mentioned before, I'm constantly bookmarking new recipes to try, and while I don't actually make nearly as many of them as I'd like to, I do try to devote a portion of my kitchen time to trying out recipes from blogs that I like without adapting the recipe to make my own. This round-up has a variety of recipes from main dishes to an appetizer, snacks, breakfast and dessert! Hopefully you find at least one new recipe or blog here to inspire you too! 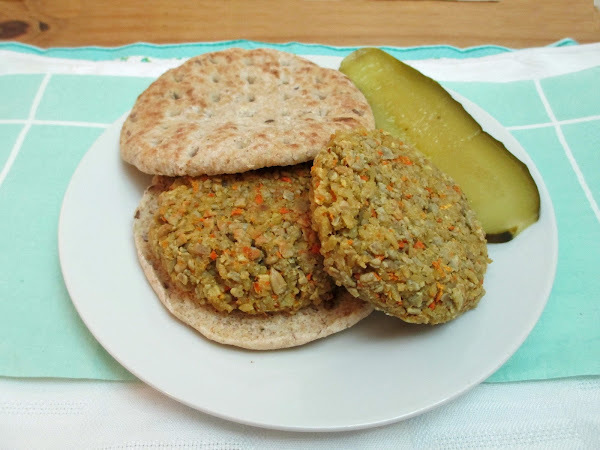 I've never had the original Sunshine Burger - a veggie burger made of brown rice, sunflower seeds, carrots and spices, but now that I've got Caitlin's easy and tasty recipe for a homemade version, that's all I need! I loved the texture of these burgers with the chewy rice that crisped up on the outside after baking in the oven. I think I ended up with slightly smaller burgers than I should have because I couldn't stop eating the unbaked burger mixture! This recipe has been pretty popular in the blogosphere since it was posted in January, so I decided to try it for myself. Now I see why everyone who tries it raves about it! The soup itself, made from carrots, onion, garlic, and spices, is delicious but the garnishes really make it special. Crunchy roasted chickpeas add texture and substance, and the creamy lemon-tahini dollop blended in so well. Definitely a soup I will make again in the fall! While I loved both of the previous recipes, this one may be my favourite of this post because it surprised me in how good it turned out! It's a vegan pate made from soaked cashews and walnuts, cooked lentils, nutritional yeast, peppercorns, and a few other flavouring ingredients, topped with seeds (I used sunflower seeds instead of the recommended pumpkin seeds). After baking for two hours, you end up with a firm yet creamy and spreadable pate that smells and tastes amazing. I served this on Easter with mini melba toasts and a baguette, and enjoyed the leftovers on toast the next day. It's been a long time since I've had the non-veg kind of pate, but everyone who tried this gave it good reviews and commented that it not only looked just like the real thing, but it tasted even better and is much healthier too! 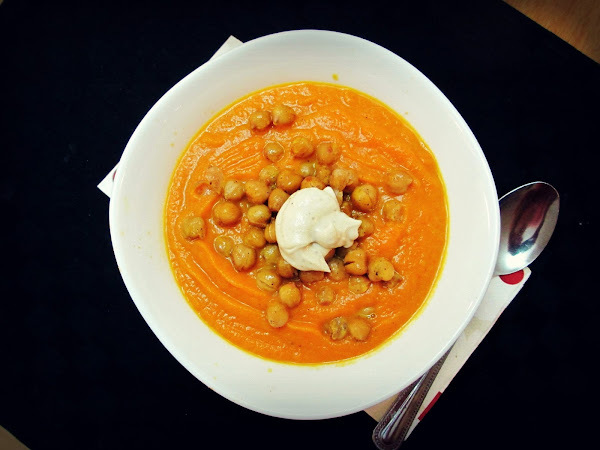 I had some leftover chickpeas sitting in my fridge last week and looked through my bookmarked recipes for some kind of treat or snack that I could use them in. After a failed attempt to make a chickpea based coffee cake (no matter how long I left it in the oven, it refused to cook and ended up in the garbage), I came across these carrot cake chickpea hummus bites and made them instead. 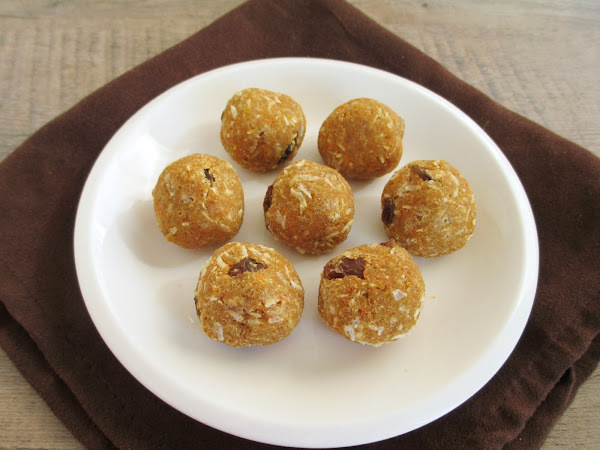 They have a soft texture inside that reminded me of a similar chickpea recipe that I love, these rosemary apricot tahini bites, but with ingredients like carrots, raisins, and coconut to resemble carrot cake. I used shredded raw carrot instead of cooking the carrots first, and next time I would use the full amount of sweetener, but I liked these as a healthy afternoon snack! 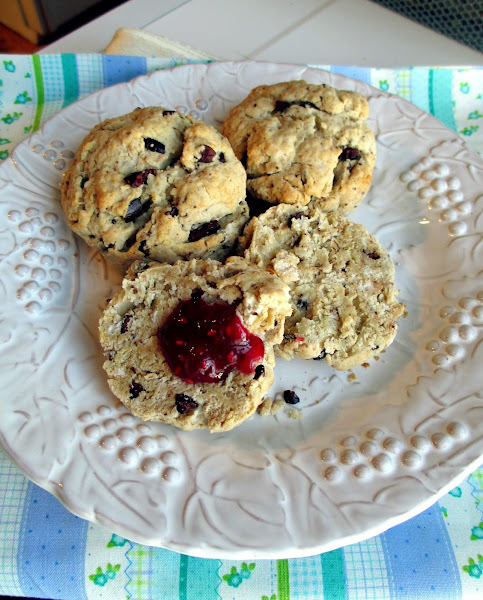 I have so many healthy banana cookie recipes bookmarked, but this was the latest one that I tried. 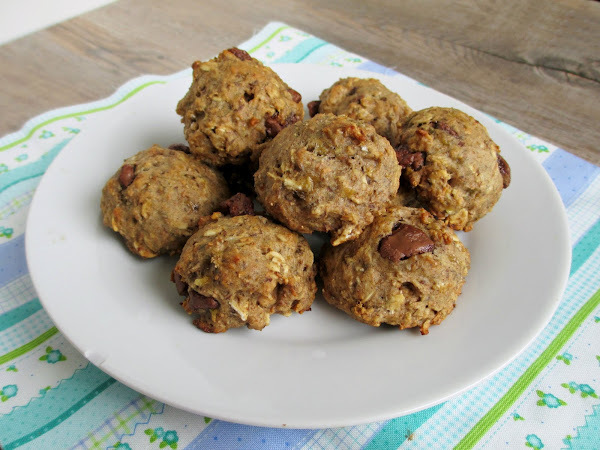 These are a soft cakey cookie (more like a mini muffin) that really does taste like banana bread with the addition of almond butter, oats, and chocolate chips. Mine were a little on the plain side because I didn't have enough chocolate chips, but if you follow the recipe exactly and you love banana bread, then you won't be disappointed with these! I made these as a treat to bring home to my parents recently but I ended up eating a lot of them myself because I liked them so much! 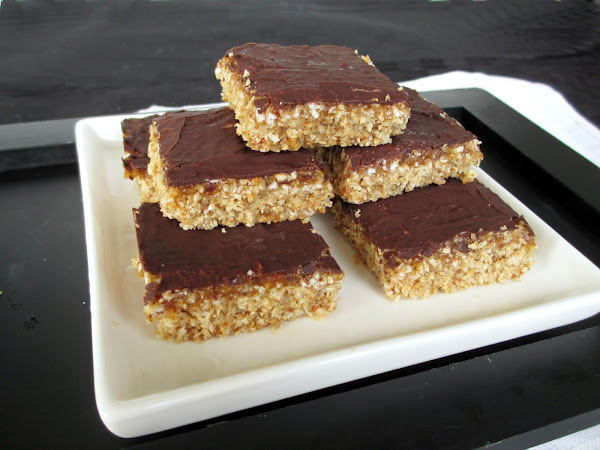 The base of these bars is a raw "cookie" made of almonds, oats, coconut and dates. Next you spread on a thin layer of coconut "caramel" made from dates, almond butter and maple syrup with more coconut, and finally they're topped with a layer of chocolate (I covered them completely with chocolate rather than doing a drizzle like the original recipe). I thought these tasted like a decadent chocolate bar, but I loved that they were actually pretty healthy! And of course, I love any dessert that has coconut! I don't make scones often, but I made a small batch of these for my Dad and I for breakfast as a treat when I was home recently. Instead of using espresso powder and dark chocolate, I used instant coffee and raw cacao nibs, and irish cream flavoured agave nectar since I happened to have some in the cupboard. Mine came out a bit too undercooked inside, which was too bad because they were really good otherwise - they were still a bit soft and not too dry or crumbly, and I loved the addition of crunchy cacao nibs and the hint of coffee flavour. That's all for this round-up! Have a great weekend and I'll be back with a new recipe next week! what a great roundup of recipes you've tried! i'm so happy you enjoyed the sunshine burgers and i'm definitely going to make that carrot soup! This is such a nice collection! And it's so kind from you to share the recipes from other blogs. I'm a huge fan of sharing, community and helping each other out... after all that's what I learned from my Nonna in the kitchen! 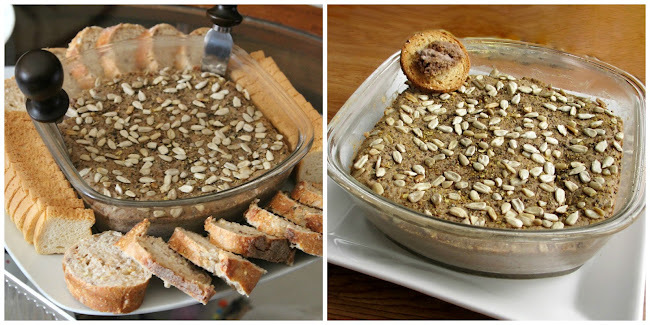 Great roundup..the pate sounds tasty! I want to try those burgers too! I buy them once in a while when they're on sale, but they only have 3 in the package, which is such an odd amount! Haha, that is an odd amount! This recipe only makes 3 too, but at least you can double it easily, and mine froze fine!